Have you seen hydrolats mentioned in our blog articles or included in our aromatherapy recipes and wondered what they are exactly? If the answer is yes, then read on to find out more. We'll explain what they are, how they are produced, and how you can use them therapeutically in many different ways! Before we get started we should point out that hydrolats are sometimes known as hydrosols. The term hydrosol is derived from the latin words ‘hydro’ (for water) and ‘sol’ (for solution). The term can be used for any water-based solution, and not just the therapeutic plant waters that we’re discussing in this article. The most accurate technical term for these waters is ‘hydrolate’, which is derived from the latin words ‘hydro’ (water) and ‘lait’ (milk). This is because the water has a milky appearance when first produced. The word hydrolate can also be shortened to ‘hydrolat’, which is what we call them here at Base Formula. The terms floral water or flower water are also used by some, but are not particularly accurate, as hydrolats can be distilled from a variety of plant material not just flowers e.g. leaves, needles or berries. Some flower waters may also be produced via a completely different method such as mixing essential oil with water, or steeping plant material in water, and some may even be made from synthetic ingredients. None of which have the same therapeutic properties as 100% pure and natural hydrolats. So, what exactly are hydrolats? Well, very simply they are the natural waters that are collected when plants are distilled to extract their essential oils. For example, to extract Lavender essential oil, steam is passed through the lavender plant material. The heated steam and gentle pressure causes active chemicals from the plant to be released into the steam. The steamy vapor then flows through a condenser which cools it down and turns it back into liquid form – yielding a layer of oil and a layer of water. Some of the chemicals released from the plants are non-water soluble and repel water – giving us the layer of oil which is known as ‘essential oil’. The water-soluble chemicals dissolve into the layer of water and this is what is known as the hydrolat or hydrosol. As well as the water-soluble plant extracts, the hydrolats also contain tiny amounts of essential oil. The hydrolat therefore resembles the pure essential oil in terms of its therapeutic effects but is far gentler as it is naturally diluted in water. Please note that a pure hydrolat will not necessarily smell like its corresponding essential oil due to their differing chemical constituents, and some may have no scent at all. The common misconception is that hydrolats are ‘just’ a by-product of the essential oil production process. This is wrong: pure hydrolats are also produced as they have their own unique purpose and are valuable therapeutic products in their own right! Our bodies are made up of mostly water, so it makes sense that hydrolats have a great affinity for supporting us. In other natural therapies, such as homeopathy - which argues that the more diluted a substance is, the more therapeutic it can be - there is support for the idea that ‘less is more,’ which highlights just how impactful hydrolats can be! Likewise, often, the higher the dilution, the gentler the action, making hydrolats particularly suited to sensitive situations that require gentle care. But, hydrolats aren’t just a gentler alternative to essential oils, and they don’t have to be used in isolation – the two complement each other well. Mixing hydrolats and essential oils can add flexibility to your blend and enhance its therapeutic value. Alternatively, having a perfect pH, and because they are already diluted (unlike essential oils), you can simply use them as they come, and even apply them direct on the skin – though that’s not to say you can’t dilute them even further! When selecting hydrolats or hydrosols, the most important thing to check out is how pure and natural they are. As we mentioned above some ‘floral or flower waters’ can be synthetic, or contain artificial additives, alcohol, preservatives and colourings, which affects the therapeutic value. Look for 100% pure and natural hydrolats, such as our range here at Base Formula; then, you can’t go wrong. 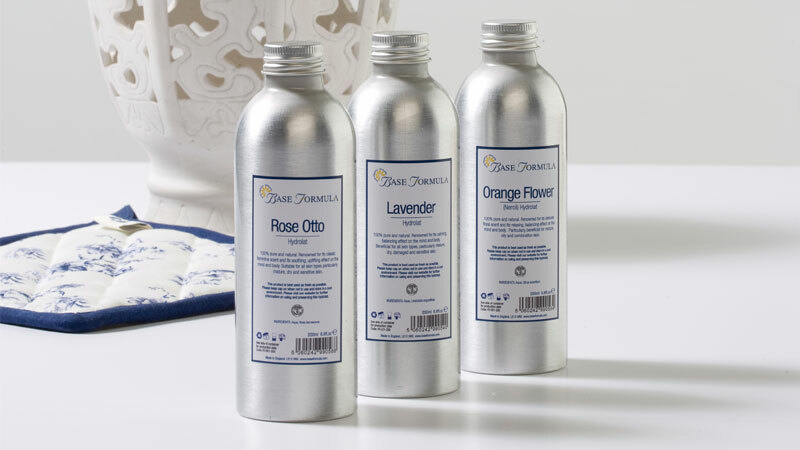 We offer the following varieties: Chamomile, Lavender, Orange Flower (Neroli), Rose Otto and Witch Hazel - which offer a wide range of uses. One thing to note is that, because they are so pure and delicate, with no added preservatives, they are not as long-lasting as essential oils, so we advise that you keep them in the fridge if possible, and use within 3 months of opening. Use Chamomile Hydrolat as a cleanser and toner for generally sensitive skin – and you can add it to your regular cream or lotion to help moisturise too. Add 1ml of hydrolat to 9ml of lotion or cream. Use Lavender or Rose Hydrolat as a cleanser or toner to balance dry skin. If you’re not too sensitive, try adding 1 drop of Rose essential oil to 5ml of Rose Hydrolat to boost hydration! For oily skin, try the above cleanser, toner or moisturiser, but with Witch Hazel Hydrolat. If you want to add essential oils, try 1 drop in 5ml of either Geranium to balance hormones and sebum, Lemon to reduce oil, or Tea Tree as an antibacterial. To combat spots, apply Witch Hazel Hydrolat directly to the affected area and cleanse skin daily. Make your own face mask sheets by soaking one of our compressed face mask towels in your chosen hydrolat. Then place over the face for 10-15 minutes to soothe and hydrate. For a sensitive skin clay face mask, use Kaolin Clay mixed with Chamomile Hydrolat, or for oily/blemished skin try Witch Hazel mixed with French Green Clay. For a lovely, refreshing eye mask, douse cotton pads with refrigerated Orange Flower (Neroli) Hydrolat and lie back and relax for 5-10 minutes! Alternatively try Chamomile Hydrolat to help reduce puffiness and dark circles. Hair masks can be made from mixing 10ml Rose Hydrolat with 3 drops of Ylang Ylang essential oil and applying to the hair for 10 minutes before washing off. You can scale-up the quantities up for long or thick hair. Another great way of using hydrolats is in a spritz! We absolutely adore this technique as it can be so refreshing. Try creating spritzes for aiding sleep, hydrating or cooling the skin, or as an air freshener – the choice is yours! Sleepy spritz – in a spray bottle mix 100ml Lavender Hydrolat (or use water) with up to 30 drops total of your choice of essential oils – I’d recommend Lavender, Ylang Ylang and Sweet Orange. Hydrating spritz – if you’re going on holiday, this is a great one for dry summer skin and even sun burn. Mix 100ml total of Orange Flower (Neroli) and Chamomile Hydrolat with up to 30 drops total of essential oils – for skin hydration try Rose and Sweet Orange, and for sunburn try Rose and Lavender essential oils. You can also take mini bottles of this to keep your skin hydrated on the plane! Cooling spritz – in the summer heat, try mixing Chamomile Hydrolat with cooling Peppermint and Lavender essential oils. Keep this one refrigerated to really maximise the cooling spray! Air-freshening spritz – to refresh the air around you try using 100ml Rose Hydrolat with up to 30 drops total of Bergamot Mint, Geranium and Ylang Ylang. You can also use the spritz idea to make a perfume base – and even homemade deodorant! Hydrolats are so versatile because they can be applied directly to the skin, so why not get creative and blend your own mood boosting perfume. Use up to 30 drops total of up to 3 different essential oils in 100ml of your favourite hydrolat. Bergamot, Sweet Orange, Neroli, Rose, Jasmine, Geranium, Ylang Ylang and Sandalwood essential oils make good perfume options. For deodorant, try adding 100ml Lavender Hydrolat to a spritz bottle, mixed with up to 30 drops total of essential oils: I’d recommend Lemongrass, Geranium and Lavender for their antibacterial and balancing properties! If you enjoy making your own natural soaps, you’ll know that you use water as part of the process. So, why not use a hydrolat instead to keep it nice and natural, but add therapeutic benefits? Cleansing cuts and grazes – Chamomile, Lavender and Witch Hazel are great cleansers for surface cuts and grazes – just apply them to something sanitary (i.e. cotton pad, gauze) to clean the affected area. Compresses – Chamomile and Lavender hydrolats make useful bases for compresses. Soak a clean cloth in the hydrolat and then apply it to the affected area. Use a warm compress for aiding circulation and blood flow to help relax and soothe muscles, or use a cold compress to reduce inflammation and swelling. To soothe sensitive rashes, spritz Chamomile Hydrolat onto the affected area. Hydrolats are great for children – and are even gentle enough for use with babies. Use hydrolats, diluted 50:50 with water, for cleansing the skin (Chamomile), add a few tablespoons to the bath to soothe irritated skin or anxiety (Lavender), or use pure hydrolat in a room spritz to encourage calm and relaxation at bedtime (Chamomile and Lavender)! As long as you’re using 100% pure hydrolats, these will be ideal for using with kids! My favourite tip for using hydrolats with children is to create wet wipes that can be used for a multitude of sins – including wiping children’s bottoms! Use a thick tissue and spray on Chamomile Hydrolat for a gentle, more skin-kind wet wipe. Add 50ml of Lavender or Witch Hazel Hydrolat to a warm bath and relax there for a little while. You can add Epsom salt to the bath if this helps, too. If a bath is not accessible, you can add 2ml Lavender Hydrolat to 8ml of their regular body moisturiser, or Grapeseed oil and massage into the skin in the direction towards the heart to get it into the system. For constipation, massage the abdomen gently, in a clockwise motion. For chesty conditions that need decongesting, try adding Lavender Hydrolat to a bowl of steamy water then lean over with the eyes closed to inhale the aroma. Similarly, to the elderly, those with fragile immunity suffering chronic illness can adapt aromatherapy blends to include hydrolats instead of essential oils where necessary. If you are new to using essential oils, hydrolats can be a great starting point, before building up to using essential oils! In particular, Lavender Hydrolat is a great immunity builder and has anti-viral properties, but Orange Flower (Neroli) is good too. Why not mix the two in either a bath, a body moisturiser for massage, or do an inhalation daily to build up immunity? Likewise, you could make some of the lovely relaxing room spritzes to enjoy! Another couple of tips are that hydrolats can also be used as plant mists to keep leaves hydrated, and, they are safer for use with animals! There’s much debate about the use of essential oils with animals, but we can safely say that if you want to use aromatherapy (you know your pet best), hydrolats would be the better bet! Mix your hydrolats 50:50 with water in a spritz to mist around the house! As you can see, hydrolats are extremely versatile and can be combined with many other things for a wide variety of uses. Here are a few more ideas for you to try at home or with your clients! Why not try a gorgeous foot soak with hydrolats? Fill a bowl with warm water and add Lavender, Rose or Chamomile hydrolats to it for a beautiful and more delicate approach to foot care. You could even mix hydrolats into a foot scrub for use after the foot bath: mix 1tsp of Himalayan Pink Salt, 1 tsp of oats, 1tbsp Kaolin Clay, 1 tsp Grapseed Oil, and enough of your choice of hydrolat to make a paste, then exfoliate away before washing it off in the original foot soak water! For a more natural hand sanitiser gel mix 250ml of Aloe Vera Gel with 10ml Witch Hazel Hydrolat and 3-4 drops each of Tea Tree and Peppermint essential oil. For a natural insect repellent spray mix 100ml Witch Hazel Hydrolat with 20 drops Geranium, 4 drops Citronella and 2 drops Eucalyptus. I hope you’ve enjoyed our top tips for using our healing hydrolats. Why not get creative with your own ideas? Integrating hydrolats can really aid your aromatherapy abilities and enhance your blending options. We are off now, for that foot soak and scrub – it sounds divine! Until next time, enjoy your hydrolats or hydrosols - or whatever you choose to call them!